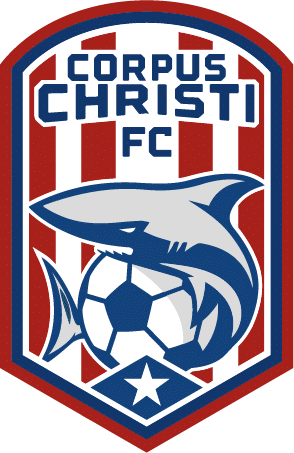 On February 23rd, 2018 from 12:00PM to 2:00PM Corpus Christi FC will host their 2nd and final tryout for its 2019 season at the Butler Soccer Complex in Corpus Christi, TX. 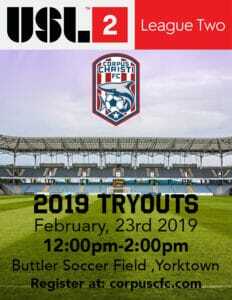 In preparation for the upcoming 2019 season, The Sharks have announced 2 open tryout dates the first tryout was completed on December 1st, 2018 from 12:00PM to 2:00PM, the second and final tryout will hold on Saturday February 23 ,2019 at Butler Soccer Complex. The tryouts will consist of speed and agility drills that will end with a scrimmage to assess and evaluate the players talent. Male players who will be 16 years (by June 1, 2019) or older are qualified to participate. There is no upper age limit to participate, A non-refundable $40 fee will be made upon registration online, cost includes 1 training t-shirt that will be worn during tryout. There will be no on-site registration, all players must register online on our website. A mandatory check-in will take place at open tryouts and registrations must be completed online a day prior to tryout date. Members of the football club will be evaluating the players and providing feedback to the coaches. The USL League 2 is a proven pathway for athletics to rise to the very top of professional soccer. The #MLSSuperDraft 2019 Day 1&2 saw 61 former League Two players chosen! Overall, 61 of the 75 players selected by MLS clubs came from USL League Two (81.3%)!